When downloading photos, music and programs, you collect all data in a common download folder, and then you normally sort them manually depending on the file type. Collecting all files in one common download folder is a good start. You can then easily automate the next step of sorting with the free tool Download Mover. 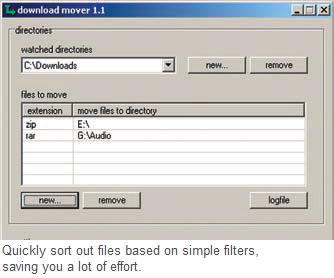 A download of the somewhat old but user friendly tool is available at www.ntworks.net/download-mover. html. Unzip the downloaded file in a new folder. Further installation is not required. After starting it, configure the desired rules. Near the combination field ‘watched directories’, click ‘new’, and then navigate to the download folder and activate it with ‘OK’. Basically, any number of folders can be considered. Then click ‘new’ in ‘files to move’. Specify a type e.g. ‘zip’ or ‘jpg’ and click ‘next’. Now navigate to the target folder that must have been already created. Confirm the selection with ‘OK’. In the same way, define the rules for the other data types. This also works when sorting the available folders. Note: The functionality cannot be integrated into the system. But you can establish a link in the auto-start folder and thus automate the process.